Asking a friend for a movie recommendation, they threw out there ‘Upgrade’ which has just graced the movie theatres. I’m glad I didn’t watch the trailer as I’m not a great fan of horror or gore, but sci-fi is right up my street. 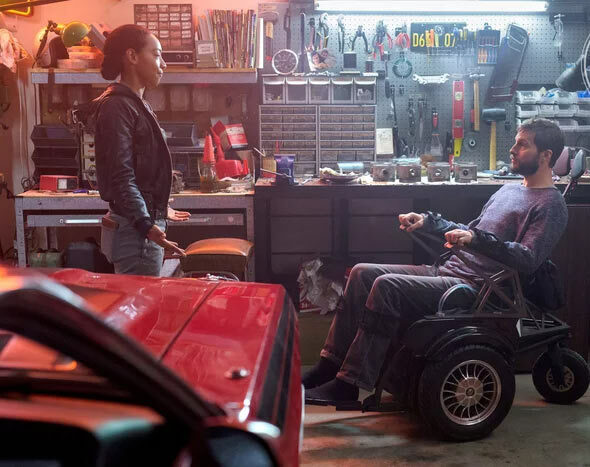 Anyways, it turns out that the hero of the movie Grey Trace(Logan Marshall-Green) just so happens to restore and drive muscle cars. The movie is set in a near future where most of our lives have some form of computer automation. As the movie is pretty new and it’s just general reviews online at present, there’s not much information on the cars used in the film. Apart from the futuristic vehicles, the main two muscle cars looked like a 1970 Dodge Challenger variation and a 1977-78 Pontiac Trans Am. 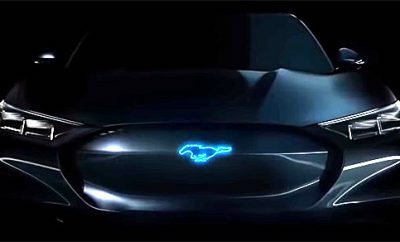 As I was in the movie theatre and more enjoying the film than in muscle car spotting mode, getting the exact details and models of the car is going to be more general than anything else, so don’t scold me on the exact details at this time. The first car shown is a 1977-78 Pontiac Trans Am, with the hood scoop from the looks of things. It gets quite a bit of showing in the opening scenes, eventually being delivered to the baddie Eron Keen. The Challenger looked to be a 1970 model with a mid. body stripe kit, maybe a T/A, but without the hood scoop. One close-up shots showed new, colour-coded side mirrors. As with any movie vehicle, they are usually a mash up from different years, which is probably the case here to an extent particularly the Challenger. If you don’t mind the gore factor and scenes of violence, this is a great film to watch and the positioning of the muscle cars plays more than just some vehicles for a chase scene or a bit of eye candy. 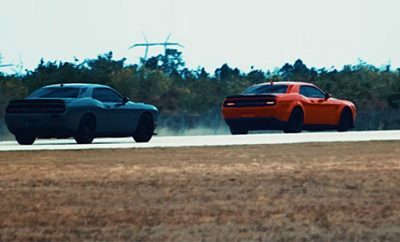 They represent old technology, but more than that they are things we have total control over, simple to fix and as per the car chase when the Challenger gets away, potentially still the best choice no matter the advances in technology. Seeing the Firebird and Challenger designs compared to futuristic cars was like comparing oil paintings to an 8 bit generated piece of art. Both are valid, but the muscle cars clearly had a more organic design based on what we thought looked the best, rather than what a computer told us is the best. It’s kind of saying just because something is an older design doesn’t mean it’s outdated or redundant. I also thought it was interesting that the Firebird was delivered to Eron Keen. Of all the cars he could have chosen, he chose a vintage muscle car. This could have been just so he could meet Grey Trace, but on another level he could have chosen the Trans Am as it represented an analog time, fully under human control, which we later find out he didn’t have. Then again, he may have just been a bit of a muscle car collector on the side and a fan of Smokey And The Bandit. 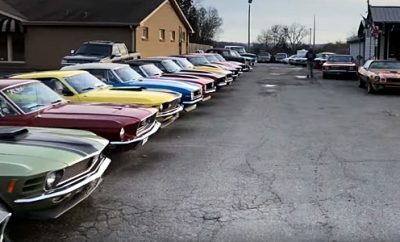 In other words, it’s great to see muscle cars being featured in a great film, but also to represent a past way of life which represented full control and freedom, not old and outdated. definitely worth a watch. 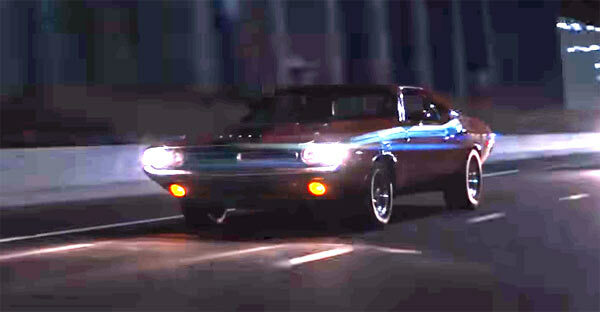 Next Story → Custom 1968 Dodge Charger RTR: Original Or Custom?